Scuba Careers: Oh, the Places Scuba Divers Go! Figuring out what you want to be when you grow up can be a real challenge. At age 50, I’m still working out some of the finer details myself. Fortunately for me, I’ve still got a lot of growing up to do, so I don’t feel overly pressured to make decisions regarding such important matters. My own career path has been a bit circuitous, weaving threads of marine and aerospace engineering, commercial aviation, consulting, journalism and fatherhood into a fascinating career fabric. If there’s one thing I’ve learned on this wayward career journey, it’s the importance of doing something for which you have real passion. Not everyone can be a professional athlete, rock star or brain surgeon, but if we can keep our career centered on the things we love, then we’ll probably work hard at whatever it is we do and, in the long run, success will come. For anyone drawn to the underwater world, maintaining a focus on diving can help keep our lives exciting and fulfilling, even if we don’t get rich doing it. While pursuing a scuba diving career might seem like a good idea, it pays to be somewhat pragmatic in our dive-oriented career goal setting. Example: A recent study conducted by the Economic Research Institute revealed that the job of sponge diver — along with globe mounter, telegraph editor, bone crusher, quartermaster, bonbon dipper, and banana ripening room supervisor — is one of 15 careers that are disappearing. So much for my aspirations of one day becoming a sponge diver. Still it’s amazing the diversity of career spokes that radiate from a hub of interest in diving, and that career wheel can spin in an amazing number of directions. Within the recreational dive industry lies a broad spectrum of scuba diving careers. While some positions such as divemaster or dive instructor require a high level of experience, training and certification, others require only minimal dive experience combined with a healthy interest in recreational diving. Many divers have found that working at a dive center in retail sales or dive travel can be a great way to combine a passion for diving with the need for a paycheck. 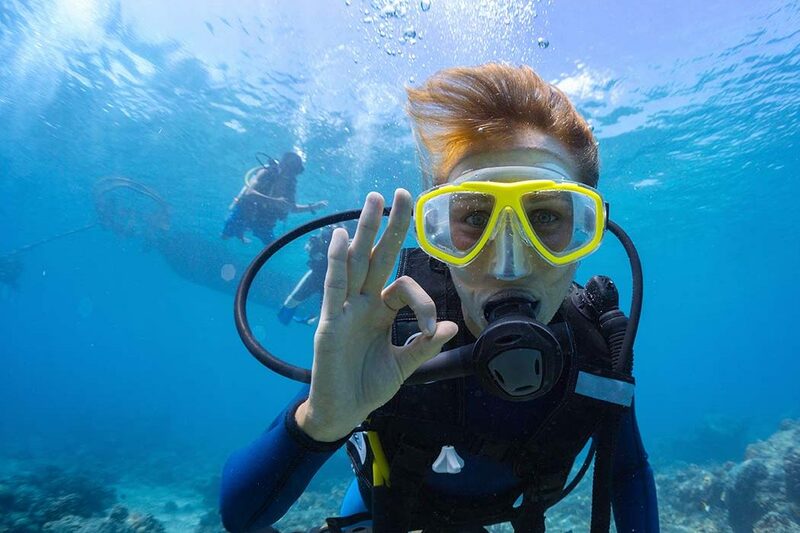 Other opportunities can be found with dive equipment manufacturers, including everything from engineering, design, testing and manufacturing to public relations and sales. For an individual with experience in one of these areas, the opportunity to work for a dive equipment manufacturer can be highly satisfying and rewarding. Several of my fellow ocean engineering graduates did exactly that, and headed down a fascinating career path. As with any other field of business, recreational diving offers opportunities in advertising, marketing and communications. While it isn’t easy to find work as an underwater journalist or photographer for a national or international dive publication, many of the same skills are also needed on a local level, for regional publications, or even for local dive centers. Similarly, it can be challenging to find work as an underwater videographer, but opportunities do exist for those with the skills, talents and the drive to make it happen. For the individual who simply has to be underwater, but doesn’t necessarily want to do so with students or tourists, the field of commercial diving is perhaps a good scuba diving career to consider. Commercial diving — or diving for pay — is a broad category that encompasses everything from cleaning boat hulls in the local marina to welding pipes on an offshore oil rig. I spent one summer of my youth inspecting and cleaning a man-made reservoir that served the fire sprinkler system of a local manufacturing plant. The water was shallow and murky, but the pay was good, and it beat bagging groceries at the A&P. 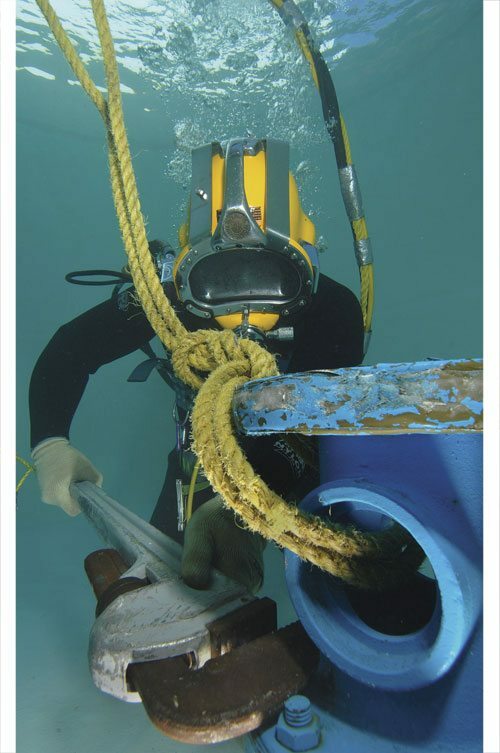 When it comes to “true” or “serious” commercial diving, it’s important to understand that diving is simply the “vehicle” by which the worker is transported to the “work site.” The actual work can involve a variety of disciplines, including underwater welding, corrosion control, inspection, nondestructive testing, pipefitting, cable installation, ship husbandry (the care and feeding of ships), and a host of other mechanical trades. One word of caution here: Do not confuse the job of commercial diver with reef roaming in the Caribbean. As Commercial Diving School Inc. in Jacksonville, Florida, tells its perspective students, “Commercial diving is conducted in the harshest environment on this planet. The sea is cold, dark and unforgiving.” If that doesn’t prickle the hair on the back of your neck, read on. Commercial divers might work in inland locations such as lakes, reservoirs and shipping ports or take on more demanding and financially rewarding offshore roles in the Gulf of Mexico and the North Sea. The work can be hard and not without risk, but for the hardy outdoors type, it can be rewarding as well. For those with a love for the sea, and a fascination with diving, a nondiving job in commercial diving can also be attractive. Such might include careers as diving medical technicians, hardware technicians, electronics technicians, and ROV (remotely operated vehicle) technicians and operators. For a diver who wants to integrate diving into his or her life, one way to do that is as a volunteer public service diver. Local volunteer fire departments often look for individuals with diving experience to fill the ranks of their emergency response dive teams. Divers may be required to provide their basic equipment, but the opportunity to train, practice and serve can fill that desire to stay active in diving, and is a great way to build experience while giving back to the community. The military also provides opportunity to a select few who can meet the requirements, and survive the grueling training. The Navy uses divers in a variety of roles from ship maintenance to combat SEAL team members. Here again, let’s not even begin to imagine Navy divers frolicking with colorful fishes on a warm-water reef. These guys tough it out in a risky world where the water is cold and the dangers are ever-present. Other scuba diving careers exist in the Coast Guard, NOAA (National Oceanic and Atmospheric Administration), or state marine patrols. While you probably won’t dive on a daily basis, the opportunity to occasionally put a fin in the water can be an added benefit to any of these careers. Yet another option in the world of scuba diving careers is that of a scientific or research diver. While you won’t find this heading listed in your Yellow Pages, a staggering number of opportunities exist in a wide-ranging variety of capacities. Such opportunities include everything from conducting scientific field surveys to monitoring historic wrecks and protected sites. Such opportunities are often associated with colleges, universities, institutions and foundations, as well as government or government-sponsored agencies. Opportunities for scientific diving also exist with water parks and aquariums, where divers are used to collect marine life specimens, perform a variety of underwater maintenance tasks, and to “perform” in front of audiences with a variety of marine life. Even NASA uses divers to help astronauts practice space missions in the simulated zero-gravity environment of an Earth-based underwater training facility. Still other dive-oriented individuals have found opportunities in diving medicine and underwater hyperbaric medicine. Such opportunities exist within the realm of academia, as well as in the government and private sector, providing medical care to divers and others requiring hyperbaric medical treatment. While the idea of finding a sunken Spanish galleon loaded with gold and treasure is deeply alluring, treasure hunting is another field of underwater endeavor at which only a fortunate few seem to find success. If you’re the gambling type, you might “hire on” as a volunteer or paid hand, with the hopes of finding that mother lode. Surprisingly, more adventurers seem to gravitate to underwater prospecting. Typically operating in shallow water of streams and rivers, divers scour the bottom with metal detectors and suction dredges to locate and recover precious gold, ore and even artifacts. Other divers make a living “mining” golf balls from the water hazards at golf courses. Hmmm. Regardless of what we might choose as a career, the skills we gain through diving can be of tremendous benefit, helping us to achieve a greater level of success. In learning to dive, we load our personal skills toolbox with a multitude of universal elements essential to virtually any career environment. We take on and master a demanding spectrum of knowledge areas. We train and test our bodies, developing a high level of fitness. Progressing through training, we learn to accept personal responsibility and the importance of self-reliance, as well as the need for close and dedicated teamwork. Throughout the entire process of becoming a diver, gaining experience, and achieving higher levels of certification, we gain a positive self-image that gives the confidence to pursue new goals and take on new challenges. Within the diver’s toolbox lie a multitude of hard-won personal skills that apply universally. We learn discipline, stress management, organization, planning, and the ability to cope with the unexpected. These assets can help make us more successful not just in our career, but in life in general. Beyond these basic skills, many of the experiences we gain in diving can be applied directly to a variety of careers. As a divemaster, assistant instructor or instructor, we gain skills and experience in teaching others, as well as leadership skills. Such skills and abilities can help us in virtually any field when we assume a leadership role and take on the responsibility of teaching or mentoring others. Experience we gain working the sales floor of a dive center can readily translate to any other form of retail sales. The experience and skills developed in running a dive center can translate directly to the management of other types of businesses. Perhaps more importantly, the converse is also true. Many of the skills we develop in other careers can be remolded and adapted for success within the dive industry. For some, a career in diving, or a diving-related field, may not be in the cards. Still, regardless of the career path we choose, an involvement in diving can be a vehicle by which we enrich our lives and the lives of others. Countless individuals have added an element of excitement and sense of reward and achievement through participation in volunteer programs. One of my fondest memories as a dive journalist was an opportunity to meet and work with a group that provided dive training to children who are cancer survivors. Perhaps most rewarding has been the opportunity to share my diving experiences with my friends and family. Watching the eyes light up, seeing the mental gears begin to engage, and smiles spread contagiously across their faces is almost reason enough to be a diver, and share our tales. I still might not know exactly what I want to be when I grow up, but I do know that it will somehow be related to diving. And if my own kids get the diving bug, maybe they won’t have to worry much about growing up, either. Figuring out what to do when you grow up can take a lot of time and thought, so why not get started early? For those who are inexplicably drawn to the wonders of the underwater world, a career in diving might be just the ticket. And just to keep things simple, we put all the pertinent career considerations in rhyme for the kids … and you! You Could be a Diver! Get up at six and work ’til two. Long hard days can be a bore. Then find a job that’s fun to do. Scuba diving is lots of fun. It’s a job for everyone. Then get a mask, a tank, some fins. Scuba is just right for me. Then earn some money, that’s the trick! Fix up dive gear just like new. And customers will all be happy. In summertime you can stay cool. Scuba dive to clean the pool! And you can work throughout the year. Maybe you could teach a class. Help the slower ones go faster. Just make sure they still blow bubbles. Make lobster bisque or oysters stewed. But it’s not work for everyone. Research sponges, clams and snails. Try marine patrol, or archaeologist. Makes scuba diving such a pleasure. Just watch for ’gators, ’cause they’re real fast! Make scuba safe for everyone. Or make a movie if you wish! You must be smart to stay alive. Weld up pipes, and other gigs. Doing things just like MacGyver! Rescuing people from under the ice. Dive dark waters, face your fears. Write a book, this magazine. It’s the best we’ve ever seen! Is a pursuit that makes you happy. Find some water and jump right in. There’s something here for everyone!